One reason for this is that the shares of the latter had outperformed in the downturn, with investors the world over looking to cut risk in their portfolios. In the correction that began in January 2008 and lasted till March 2009, Infosys shares fell by 31%, about half the rate at which shares of TCS declined. TCS shares, therefore, had some catching up to do. What’s more, TCS’ operating margin rose by 144 basis points, as better utilization and a shift in work offshore more than offset the impact of pricing declines and wage hikes. While, on the one hand, the company gave its employees an aggressive variable payout, it has increased the proportion of freshers in its total workforce to contain total employee costs. About 5,000 new people (mostly freshers) joined the company in the past two quarters, and at least 8,000 (presumably experienced hands) left in the same period. Infosys’ margins rose by less than 50 basis points last quarter. While the 130 basis points decline in pricing looks high, the company’s chief financial officer S. Mahalingam points out that this is the cumulative effect of price renegotiations that have happened in preceding quarters as well, and that pricing should be flat in the rest of the fiscal year. One basis point is one-hundredth of a percentage point. At current levels, TCS trades at a trailing 12-month price-earnings (P-E) multiple of 20.45 times, a slight premium to Infosys’ trailing P-E multiple of 19.83 times. This is a rare occurrence, since Infosys has always traded at a reasonable premium. Back in March, it traded at a 45% premium to TCS. 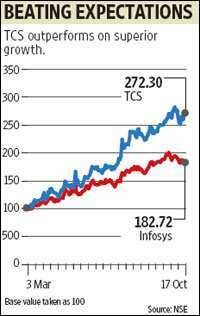 But then, such a sharp difference in TCS’ growth rates over Infosys is also a rarity. In the first six months of this fiscal year, TCS’ operating profit has grown by 7% over the profit reported in the preceding six month period, that is, between October 2008 and March 2009. During the same period, Infosys has reported a 4.6% decline in operating profit. With TCS delivering both in terms of superior revenue growth and cost management, analysts are likely to revise earnings estimates for the current year and the next year by a fair margin. This should lead to a re-rating when trading resumes on Tuesday.